Somewhere out in the middle of New Mexico’s San Juan Basin, there is a piece of sandstone that sits atop a column of mudstone. Recently, it has become a kind of holy grail for landscape photographers. It has been given a name: “The King Of Wings”. I have known about this formation for a few years and have thought it would be nice to find it and photograph it, but other things kept popping up and the wing remained on the back burner. In the spring of last year (2012) a fellow from California contacted me about booking a Photo Tour. He wanted to go to “The King Of Wings”. I told him that I didn’t know where it was, but he didn’t want to take no for an answer. So began a long distance collaboration to discover the location of this particular formation. Over the course of the next couple of months, we corresponded by e-mail and I told him that I thought I had an idea where our prize might be. I went out to the place I suspected and made an exhaustive search, but came home tired and empty-handed. Then one day he e-mailed me with the news that he had found it on Google Earth. We made tentative plans to meet when he came to New Mexico to photograph the wing, but I was unable to join him on that trip. Over the next six months, the wing was once again relegated to the back burner as other things took priority, but every once in a while a small voice would interrupt my train of thought telling me to go and find that damn wing. Finally, I put a day on the calendar and made plans to make the trip (and silence the voice). Robin and I set out early on a Sunday morning and made the three and a half hour drive to the area that serves as a starting point for the walk to the wing. When we arrived, there was about six inches of snow on the ground and looking out across the white, featureless landscape, I began to have second thoughts. I consulted my GPS: 1.7 miles (as the crow flies) to the wing; we decided to go for it and set out across the rolling, snow covered plain. Actually, the hike was more than three miles (since we are not crows and are unable to fly), not very far really, but trudging through the snow, up and down hilly terrain with camera gear and tripod is a bit different than a walk in the park. After finally coming to the wash where the landscape suddenly changed from bunch grass prairie to badlands we knew we were getting close. We skirted a rock outcrop and I consulted my GPS. I looked in the direction the little magic box indicated, and there it was, still a half mile away, but in our sights. What makes this wing special is the cantilever (12 feet) of the stone beyond the supporting column. It’s whereabouts is a closely guarded secret by those who have found it, so I will respect that and keep the secret, but I have to wonder what all the fuss is about. The day I chose to make this long anticipated trip was clear with nothing to interrupt the agonizingly blue doldrum sky but the waxing gibbous moon. I told myself that this was an exploratory venture, that I would return on another day when the skies were more photogenic. Perhaps, perhaps not. The last image is the obligatory wing portrait with Robin and me seated beneath the cantilever to give a sense of scale to the thing. 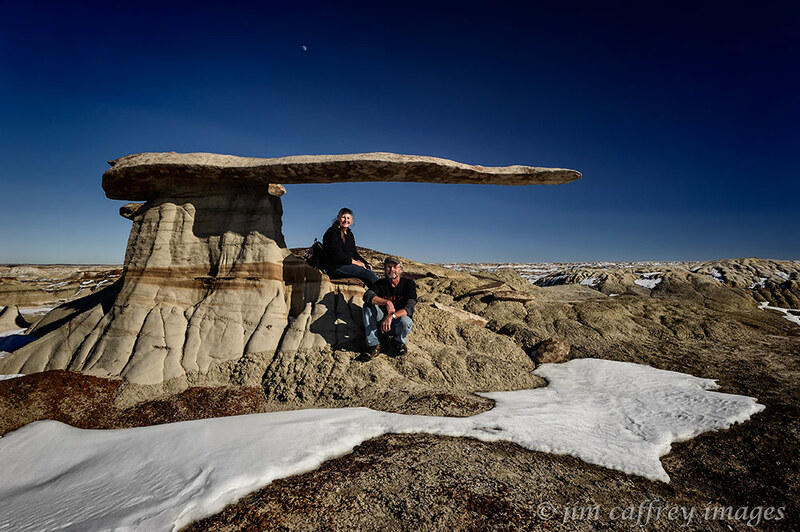 There are other formations and hoodoos in the area, but they are really nothing special, so we packed up and hiked back to the car. Now I’m sitting here writing this and asking myself if I’m being fair. I am glad that I finally made it to the Big Wing (King of Wings seems a bit of an over-statement to me). But, in my estimation, it’s a one trick pony. 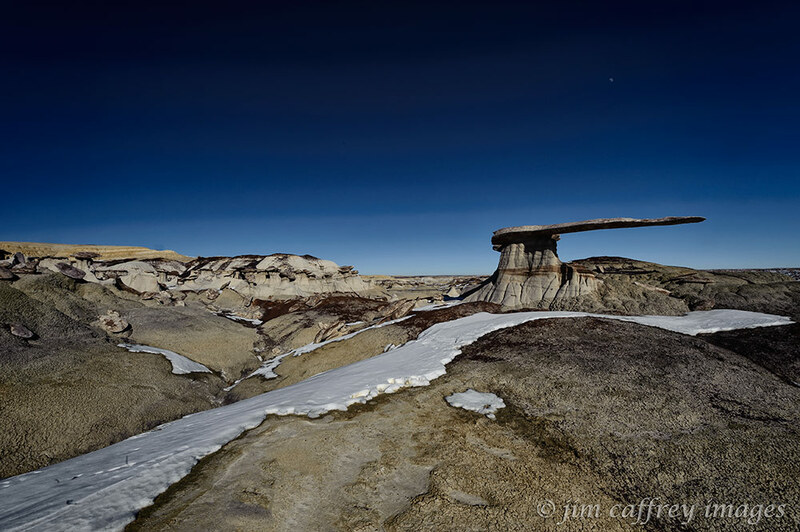 This entry was posted on January 22, 2013 by Jim Caffrey Images. 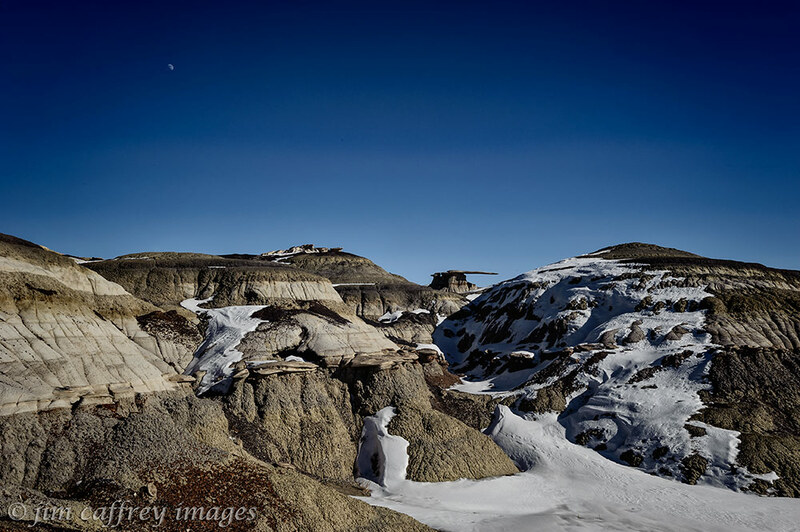 It was filed under Landscapes, Locations, Portraits and was tagged with badlands, desert, geology, landscape photography, nature photography, New Mexico, Photo, Photography, snow, winter. It does a have a unique beauty. These are lovely images Jim, as ever. It’s an interesting rock formation for sure but I can see why you might be underwhelmed. Nonetheless, I can imagine it making an interesting focal point with one of your signature moody skies as a backdrop. Thanks. I probably will return at some point when conditions are right and getting there doesn’t involve slogging through snow. Very,very special is it.I know why you want make another photo when the sky is more photogenic.But for me its fantastic. I’m glad you like my images. Sometimes a clear blue sky is best for photos like these. Wow…that’s something special. You’re lucky to live around such beauty, and have the talent to photograph it as well as you do. That’s a cool formation! I wonder who discovered it originally. Do you know its coordinates so I could find it on Google Earth? It is a cool formation, but I am not at liberty to divulge the coordinates. There is a kind of secrecy surrounding this place. Those who have found it keep quiet. 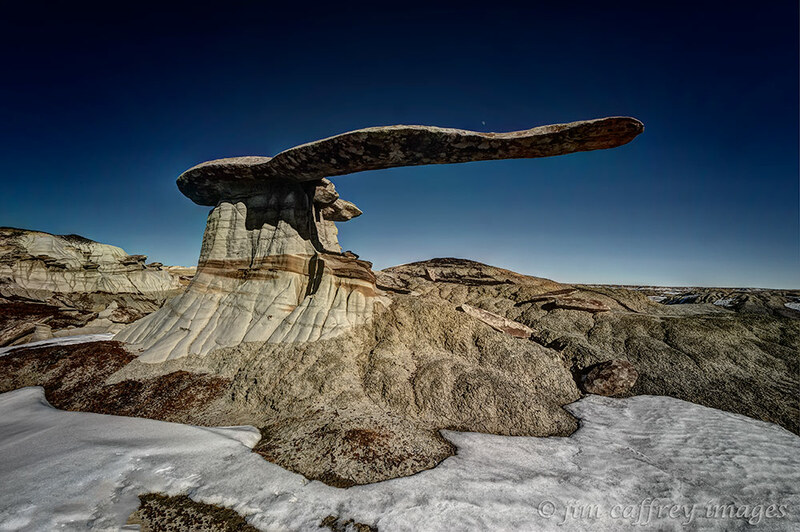 I think I can tell you that it is in the San Juan Basin and that an google search for Momo’s Wing would set you on the right track. Love it – as always. Fascinating subject and you do it full justice. I enjoy vicariously exnploring your part of the world :=) so thank you for the trip!